I hold a PhD in Food Science form the Norwegian University of Life Sciences. My areas of research interest include; traditional fermented foods, dairy technology, pre- and probiotics in food, food safety and street vended food, and food consumption patterns. I am currently employed as a lecturer in the Department of Nutrition, Faculty of Health Sciences, National University of Lesotho. I am the current Deputy Dean of the Faculty. I was previously a lecturer in Food Science and Technology at the Institute of Food, Nutrition and Family Sciences, University of Zimbabwe. I served as Head of Department there for two years from 2003 to 2005. I have examined several BSc Honours, MSc and PhD students for the University of Zimbabwe, National University of Science and Technology (Zimbabwe), Norwegian University of Life Sciences and the University of the Free State, South Africa. I have published 16 articles in international peer reviewed journals, and 6 in non-peer reviewed publications. I have extensive experience in training health officers on food safety and food inspection and I have written 2 training manuals on food inspection. I am a reviewer of the African Journal of Food, Agriculture, Nutrition and Development (AFJAND), the Online Journal of Food Science, and the Journal of Food Biotechnology. I am married with 2 children. Dr. McGadney-Douglass’ career in social work (clinical, research, and policy), undergraduate and graduate education, and academic administration spans three decades in the United States, Canada, Ghana, and other locations in West Africa. She has focused the majority of her teaching, research, and service on applied gerontology, international social work, and health care for the elderly, poor, and underserved, and international legal and social issues of refugees and asylum-seekers. Her field research in Ghana began in 1999 and has been continuous to the present time with field data collection in 1999, 2001/02 and 2005. 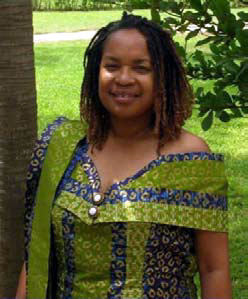 She served as Visiting Scholar at the University of Ghana in 2002-2002, and study abroad program in 2005. Currently in addition to faculty position at the University of Toledo, Dr. McGadney-Douglass is an Adjunct Professor, School of Social Work, at the University of Windsor, Windsor, Ontario, CA. In regards to teaching, Dr. McGadney-Douglass commenced her career with a five-year stay in 1977 as an Assistant Professor and Director of the Aging Studies Program (funded by the U.S. Administration on Aging) at Southern University, New Orleans, Louisiana, USA. Following receipt of her doctorate, Dr. McGadney-Douglass, added an additional 14 years of teaching mostly at the graduate level at Wayne State University (Detroit, MI), University of Toledo (Toledo, OH), University of Washington (Seattle, WA), and University of Ghana (Accra, Ghana). Dr. McGadney-Douglass’ research career began in 1992 with a field study in Chicago, IL, USA to assess the informal and formal supports of family caregivers of frail elders. This study was followed by an assessment of the impact of the use of a subsidized (electronic) personal response system/device by low-income elders in comparison to non-subsidized high-income elders on frequency of emergency room use and hospital length of stay. She conducted a pilot study assessing the impact of a policy agreement between Canada and the U.S. that influenced the recognition and settlement of asylum seekers, especially women, due to gender-based violence. Studies in Ghana included two conflict studies that focused on an analysis of indigenous management by chiefs, internally displaced women, and stakeholders; and another study that accessed the role of grandmothers in the survival of severely – Kwashiorkor inflicted- protein malnourished children. Dr. McGadney-Douglass has published as sole author and co-author in numerous scholarly journals, many peer-reviewed. Over the years, she has served as a reviewer for peer-reviewed journals. Currently, she serves on the Journal Association Boards for Research on Mothering (ARM), York University, Toronto, Canada and Reflections: Narratives of Professional Helping, California State University, Long Beach, Department of Social Work, Long Beach, CA, USA; Member of Zonta International, Chicago, IL. Dr. McGadney-Douglass holds a Doctorate degree in Social Work from the School of Social Work Administration, The University of Chicago, Chicago, Illinois, USA and a Masters in Social Work and Bachelor of Arts Degrees from The University of Michigan, Ann Arbor, Michigan, USA.